This programme connects the best of three zones that lovers of trekking and medium height mountains must get to know, with as final challenge Guallatire volcano (6,100 masl), completely accessible to the great majority of mountaineers that have just started climbing high altitudes. 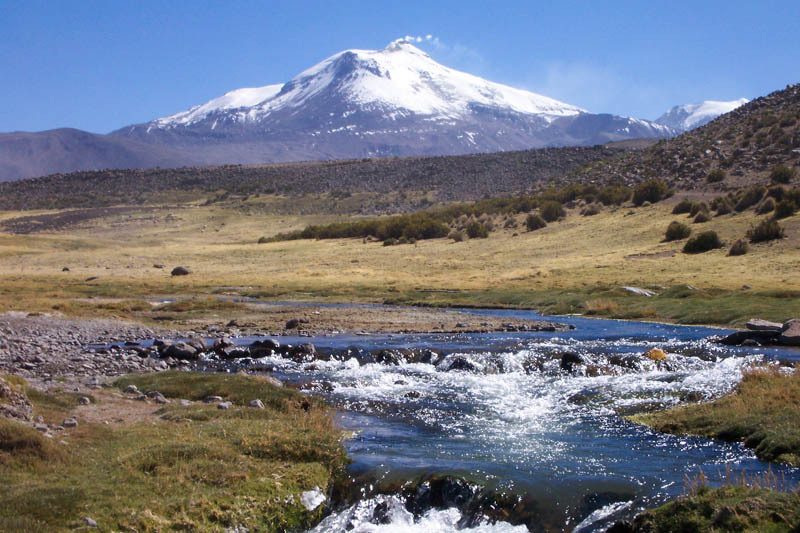 Our itinerary takes us to the Atacama Desert (the driest in the world), Salar de Uyuni salt flat (the largest in the world) and the Lauca Biosphere Reserve (140 mil hectares of very rich fauna and flora). 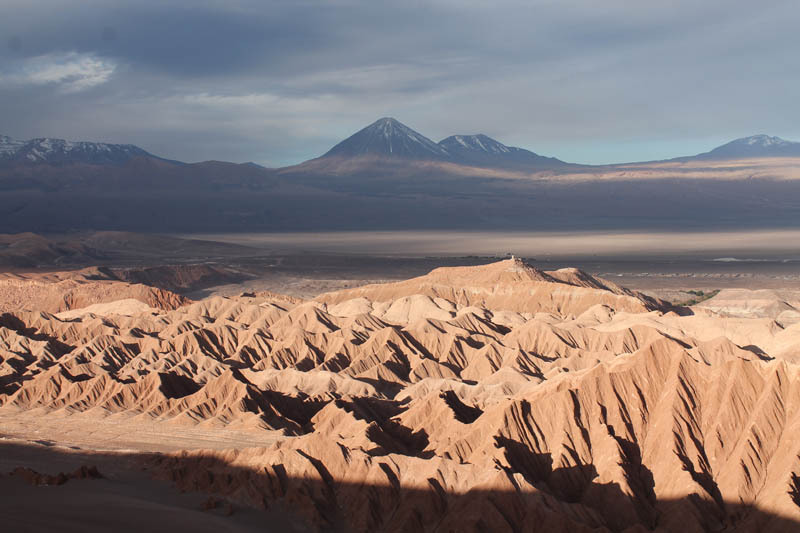 An itinerary that combines the best of the Atacama, the Andean Altiplano, its volcanoes and salt flats, where culture, nature and adventure are combined. 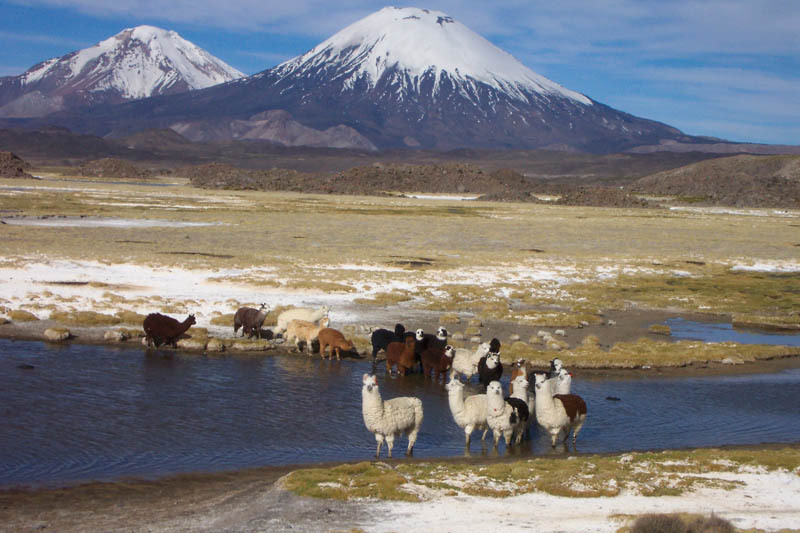 Lauca Biosphere Reserve (an orchard of life and impressive nature). 2 summits of 5,000 m + 1 active volcano of 6,000 m., as is Guallatire. ADVANCED. Programme aimed at people with mountain experience, who are physically prepared for efforts at high altitude. Walks of between 6/9 hours. Gradients on some days may reach 1,000 to 1,200 m. Summits of 6,000 metres without great technical complications with use of crampons and ice axe. Progression on slopes between 30/40°. Day 1: Santiago – Calama – San Pedro Atacama. Transfer Calama-San Pedro Atacama. Hotel. Day 2: San Pedro Atacama. Acclimatisation trekking along Puritama river (3.5 hrs, to 3,300 m high). Afternoon: Valley of the Moon trekking (3 hrs). Night at hotel. Day 3: San Pedro Atacama –Aguas Calientes salt flat. 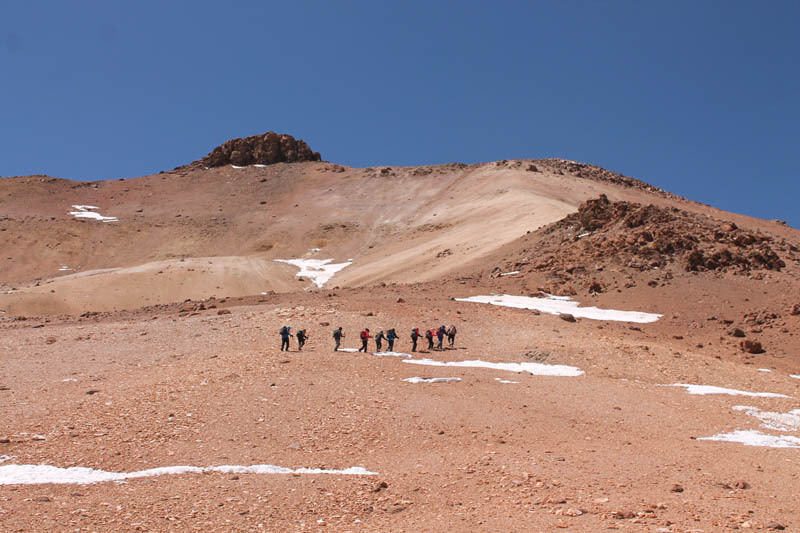 Transfer to Socaire (3,218 masl). Trekking Socaire > 3,900 m high (4 hrs approx). Night at camp (3,930 masl). Day 4: Salar de Aguas Calientes salt flat. Ascent Gris Mountain (3,930 > 4,685 masl, 6 hrs approx). Night at camp. Day 5: Salar Aguas Calientes salt flat – Tatio. 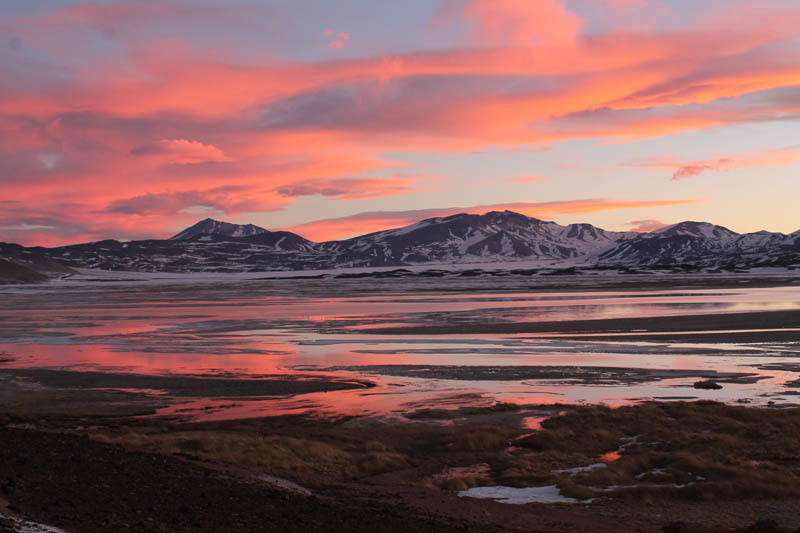 Visit Salar de Atacama salt flat and Chaxa Lagoon. Then to Tatio. Night at shelter. 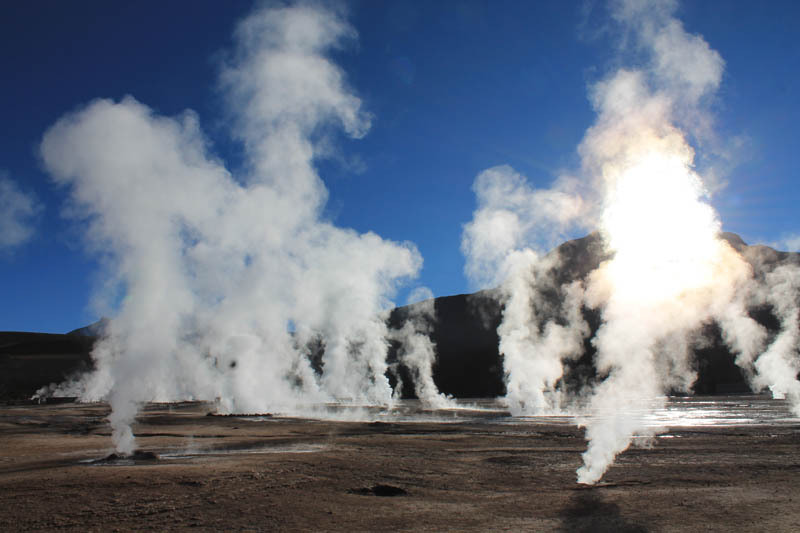 Day 6: Tatio – Caspana. Visit of the Tatio geothermic camp. Ascent Tatio Volcano (5,218 masl). In the afternoon transfer to Caspana (3,240 masl). Night at family hostel. Day 7: Caspana – Colchane. Long transfer of 675 km on the Panamerican highway to get to Colchane. Night at family hostel. Day 8: Colchane – Salar de Uyuni salt flat. Transfer to the border with Bolivia. Salar de Coipasa salt flat, Salar de Uyuni salt flat, Lomo de Pescado island, Incahuasi island. Trekking at the salt flat (approx 1.5 hrs). Night at family hostel. transfer to the border through Salar de Coipasa salt flat. Return to Chile. Night at family hostel. Day 10: Colchane – Salar de Surire salt flat. Soft trekking in Isluga Volcano National Park. Transfer to Salar de Surire salt flat. Hot springs, lunch. Night at camp. Day 11: Salar de Surire salt flat. Ascent Chihuana Mountain (5,300 masl, 6 hrs there and back). Polloquere hot springs. Night at camp. Day 12: Salar de Surire salt flat – BC Guallatire Vol. Transfer al BC Guallatire Vol. Night at camp. Day 13: BC Guallatire Vol – Summit – Parinacota. Ascent Guallatire volcano (6,100 masl, 9-10 hrs there and back). Return to camp. Transfer to Parinacota. Night at family hostel. Day 14: Parinacota – Arica. Visit archaeological museum in Azapa. Farewell dinner. Night at hotel. Tacora Vol, Taapaca Vol,. Guallatire Vol, Parinacota Vol north and south face, Pomerape Vol north face,. LlullaillacoVol, Ojos del Salado Vol.